Charge Parking – Blue Wall Technologies Ltd.
Blue Wall Technologies are Irish Dealer for DESIGNA parking systems since 2002 and have worked very hard to become one of the biggest parking system providers in the country. The DESIGNA system is easy to use, robust, reliable and Blue Wall have a very well proven record for delivering systems on time, servicing and maintaining them to ensure reliable operation and dependable revenue for our customers. Blue Wall have a proven track record delivering and maintaining busy 24 hour operating car parks of the biggest scale in Ireland whether airports, hospitals or the biggest Shopping Centres. DESIGNA systems include ABACUS for large applications incorporating integration with License Plate Cameras, Vehicle tags and open integration to any new payment or access technology using Web Services. ABACUS can use magnetic stripe or barcode tickets and can be “ticketless”. 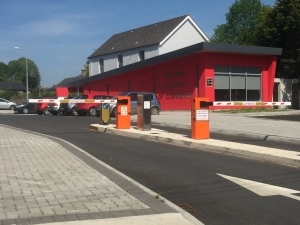 DESIGNA SLIMPARK is a lower cost option using thermally printed paper tickets suited to smaller car parks such as hotels, clinics and banks. St James, Tallaght, Coombe, Wexford General, Tipperary General, University Hospital Limerick, Royal Victoria and Mullingar General plus some 5 Primary Care Centres including Shamrock Plaza and Ayrefield Kilkenny. Dublin, Shannon & Belfast International plus Quick Park and Clayton Hotel airport car parks. St Lawrence Town Centre, Drogheda, Dundrum Town Centre, Whitewater Newbridge and Jervis Shopping Centre.